Despite sharing a title with the Genesis game, The Revenge of Shinobi for the Game Boy Advance is a totally different bag of shurikens. 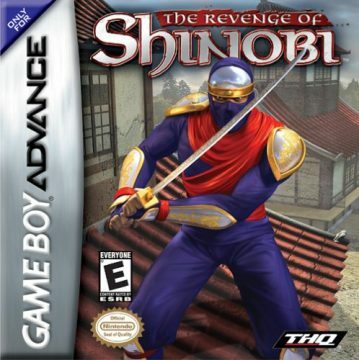 Developed by an American company called 3d6 Games, which also worked on the GBA Altered Beast title before going out of business, and published by THQ, this hackjob totally misses the point of the Shinobi series. Disregarding nearly every element of the series that came before it, the title could very easily have been “Generic Ninja Action Game“, and it both looks and feels like a shoddy Amiga release. 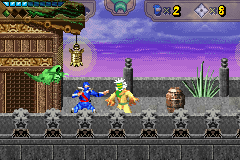 Taking place in feudal Japan, the story focuses on a ninja named Shinobi. 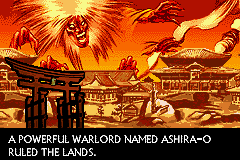 His master tells him the story of a warlord named Ashira-o, who was destroyed by five shogun and sealed within five swords. Those swords eventually corrupted all of the shogun, each of which is associated with an element: fire, wind, water, earth and darkness. As such, Shinobi must take them all down. In order to complete each of the many sprawling, non-linear levels, you need to explore the stages while rummaging through all of the nearly identical looking houses and caverns, in order to find keys or switches to open up the exit. You end up doing far more running around than actual fighting or platforming. The combat is basic and shallow, and can be reduced to two techniques: either slash mindlessly, or slash, wait a second, then slash again. It’s a little sad that the enemy AI of a 1986 arcade game outshines that of a 2002 portable game. In addition to your sword, you can chuck shurikens, but they are so few in number as to be near useless. Similarly, there are a number of magic spells, each associated with various elements, but their use is also limited. The animation is bad, the scrolling is jarring, and the controls are terrible. 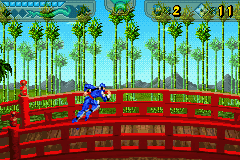 The mere act of walking down steps is incredibly difficult to execute on the GBA pad. 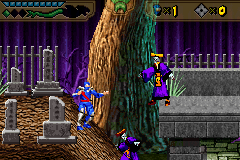 The background graphics are colorful, if repetitive, but the computer rendered sprites are blurry, indistinct and ugly. The music, which is comprised of traditional Japanese instruments, is a far stretch from the rest of the series, but the sound quality is decent for the system, at least. 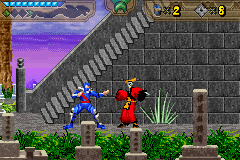 The Revenge of Shinobi for the Game Boy Advance isn’t entirely unplayable, like The Cyber Shinobi on the Sega Master System is, but it is still shockingly dull. 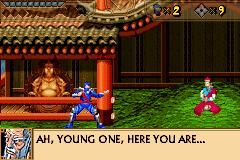 Instead, try Hudson’s superior Ninja Five-O on the GBA, which does a far better job of capturing the spirit of the series than this sub-par product.